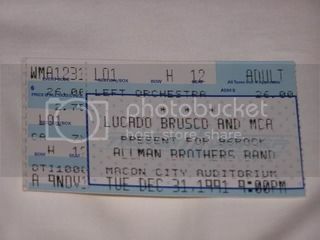 I saw the ABB in 1990 and 1991 in Atlanta. The Macon concerts around the holidays even made the Atlanta paper in a feature article. I was an idiot for not venturing down there (though I've made up for it by seeing the band 38 more times since). I would think the date has validity, but I seriously doubt the band wants the date announced right now with them trying to sell tickets to 13 shows in NY and 2 shows to a festival in Florida, both of which attract fans from all over the country. I wouldn't be surprised to see this date announced a week prior to the on sale date in March. Even then they still might limit it to one show to not take away from the draw from the other shows. As someone else mentioned it will probably be teamed with the grand opening of the Big House. I went to all 3 New Years shows back in 1990 and they were great show, they were supposed to be taped to come out as a live album but it didn't work out for some technical reasons. Great place to a Brothers show, chairs on the floor and regular seats in the balcony. The five man band did 2 shows here in Feb 1972. (Same night). The second is an archive release. My first experiece with orange sunshine. I was there for that run also. Recorded for one of the 'Evening with...' CD's, although not used. Seems like this being what one could call a farewell tour,that Macon would be a must, by all means.Even though Wanee is the same month .This sack of bone's will be there, come hell or high water.Even if i ain't gotta dime to my name and no ride.That thumb will be in the air on Interstate 75.Northbound from Fla back to the catipillar's stomping ground's. Keepin the FAITH on this one ! Besides my birthday is on the 23'rd.In May but never the less. Hey LUKE! Our 40th wedding anniversary is May 23rd! If I see you thumbing on I-75, I'll be happy to pick you up and give you a ride to Macon! Come hell, high water, or a plague of locusts, bro!